In this article you will learn about the “Sweet Spot” for investing in Madrid property. Then, we explain a clever way to optimize your Golden Visa property purchase. A number of countries offer Golden Visas. Prior to the 2008 downturn, they were mainly in the Caribbean. After the economic slide, European countries with good weather (and weak national balance sheets) began offering Golden Visas. They are attractive because most of them include the right to work and travel within the Schengen area. There are a few ways to get Golden Visas: through a property purchase (the focus on this article), through investment in a country’s government bonds, through investment in a country’s artistic heritage, parking a bunch of money in a bank account in a country and/or just general investment in the country. For all but the super rich, investing in property is the best way to get a Golden Visa. The following European countries offer Golden Visa property purchase schemes: Spain, Portugal, Greece, Cyprus, Malta and Monaco. In summary, it has the strongest property market and the best sovereign credit rating of all the above countries. There are no residency requirements and it is not on the OECD blacklist. Malta, Cyprus and Monaco have the intense disadvantage of being on this list. To learn the details about why Spain’s Golden Visa property purchase program is the best, please read: Which European country offers the best Golden Visa. Residency for your immediate and extended family (grandparents and siblings). Very cheap access to the world’s third best healthcare system. Legal right to work elsewhere in the European Union. Access to Spain’s cheap, high quality university system. Do you desire European residency, and ultimately citizenship, for yourself and your family? If so, CONTACT US TODAY to get started on your Golden Visa property purchase. How much investment is required for your Spanish Golden Visa property purchase? One is required to invest a minimum of 500,000€ in Spanish property. It must be paid for in cash, or with a foreign mortgage. Note: investment in refurbishment is not included in this 500,000€. Many of our clients wish to purchase two properties: one in which to live and the other to earn rental income. We have learned that if you buy one apartment instead of two, you can increase your rental yield by 25%, on average. Plus you get a property you really like and want to come visit. Moreover, that property will differentiate itself on the rental market and be significantly more resist to future market gyrations. 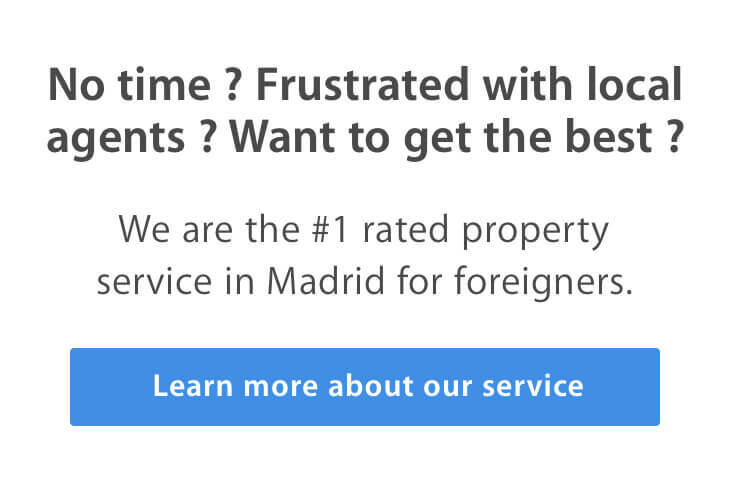 We have been active players in the Madrid property market for years. In our experience, we have discovered what we call the “Sweet Spot.” This is the price range that yields the greatest return for Madrid property investment. This range changes over time. Currently, it is between 380k€ and 650k€. If you invest in a property in this price range, you can expect a 5.5% rental yield. Your fixed costs are too high, relative to the amount of square feet you can obtain in this price range. Meaning you can’t effectively amortize your fixed costs. In this end of the market, apartments are pretty generic. It is almost impossible to find differentiating characteristics, such as French doors or a balcony, that make the apartment “pop.” Differentiating characteristics fuel rental yields and resale value. At this price range, you are unlikely to get two bedrooms. Two bedroom apartments perform much better on the rental market. Apartments over 500k€ are getting into the luxury range. If you want an apartment to live in and enjoy the extra touches, then it might make sense to invest over half a million euros. If you are buying an apartment for investment purposes, it is hard to get compensated for your extra expense. Short and medium term renters do not wish to pay extra for the little luxurious touches that you may enjoy if you are purchasing the property for your own use. To see the difference it makes purchasing a property in the Sweet Spot, let’s look at an example. In the first case, assume you purchase two properties for 250k€ each. In the second case, assume you purchase one property for 500k€. In both scenarios you get a Golden Visa. However, there is a big difference in the rental yields. Example 1: You purchase two properties for 250k€ each. For a property this size, you can expect to earn a 4% rental yield. Thus in this scenario, the two properties combined would earn you a combined monthly yield of 1667€ (833€ per month times two). Example 2: You purchase one property for 500k€. For a property this size, you can expect to earn a 5.5% rental yield. In this scenario, the property would earn you a monthly yield of 2300€. As you can see, buying a more expensive property allows you to earn 625€ more per month in rental income. Clearly, buying an apartment in the Sweet Spot is the way to optimize your Golden Visa property purchase. If you want to buy a second apartment for rental income, Golden Visa holders have an option that will allow them to buy two apartments without sacrificing rental yield. Purchase a property in which to live for 500k€. This will be sufficient to get your Golden Visa. After you get your visa, take out a mortgage to purchase another property in the 380k€-650k€ range. As a Spanish resident, you can get a visa for up to 90% of the property value. Rent this out at a 5.5% rental yield. Read this to learn how to optimize your Spanish mortgage fees. If you want to learn more about getting a Spanish mortgage, don’t hesitate to arrange a FREE CONSULTATION with one of our property shoppers.